It is officially peach season! Earlier this week I picked some fresh peaches up from my local market because they looked so delicious. I love their smell as they ripen on my counter and nothing is better than biting into a fresh peach and having the juice drip down your arm. Yum! So you can bet I was excited when I saw this simple recipe for brown sugar peaches with coconut whipped cream from photographer Joanne Andrea. Peaches and brown sugar are definitely a winning combination, but add in some coconut whipped cream? I’m sold! I think it will be perfect for entertaining guests. Wash and slice peaches into quarters. Further chop peaches into bit sized chunks. 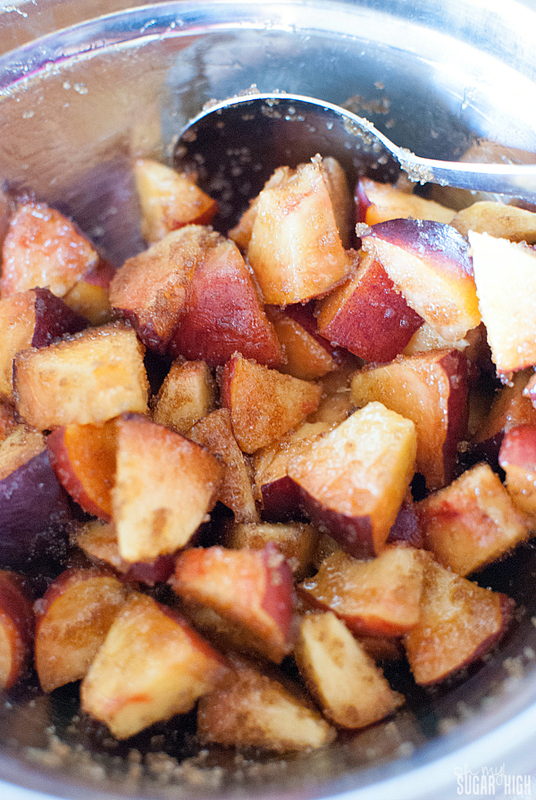 Sprinkle brown sugar onto the peaches and mix thoroughly. Set aside. 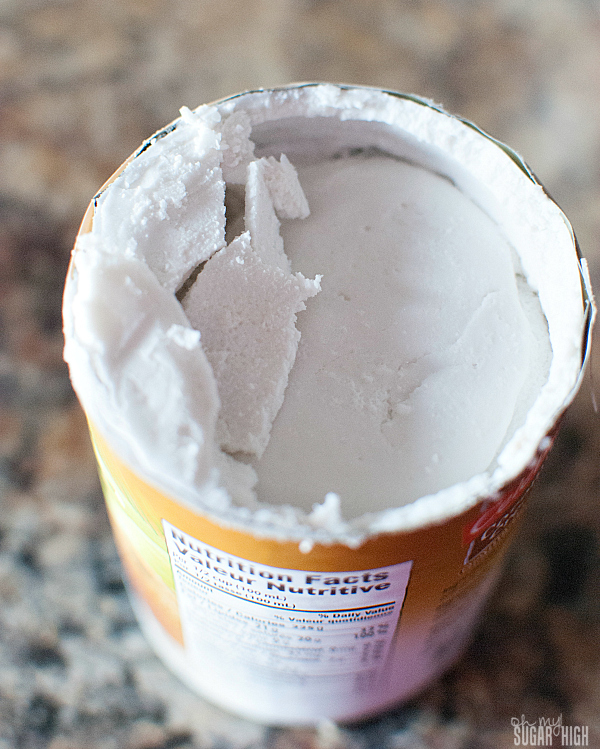 Open the chilled can of coconut cream and carefully remove the hardened coconut cream at the top of the can. Place that into your mixing bowl. Place peach pieces into two bowls. Drizzle the juice at the bottom of the bowl over the peaches. 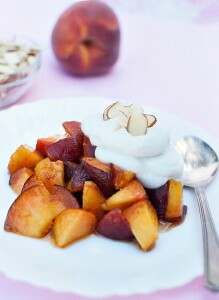 Taking your whipped coconut cream, place a nice sized dollop onto the peaches, and garnish with sliced almonds. If you aren’t familiar with coconut cream, it is rich and works great for desserts. It contains less water than coconut milk and is much thicker and more like a paste. This is a great alternative to traditional heavy whipping cream. This dessert is quick to literally “whip” up and is a great way to enjoy the fresh fruits of the summer. Thanks Joanna for sharing this recipe! Yes, thank GOODNESS for peach season, one of my favorite times of the year! I saw “peaches,” and “brown sugar,” and I was instantly sold — can’t wait to make this! I am so jealous! On this side of the world peaches are only coming next season. I definitely have to bookmark your recipe for then! – but so long I just have to share this! This looks great! I haven’t seen cans of just the coconut cream before; I typically just chill a can of coconut milk and wait for the cream to separate. I will have to keep my eyes open for the cans of cream as that would be so much more convenient and easy to use! Yum! This looks incredible! Thank you for sharing your recipe with us at the Brag About It Link Party! This looks so delicious! Thank you so much for sharing on our Living with Style Linky Party. Please come back next Wednesday! 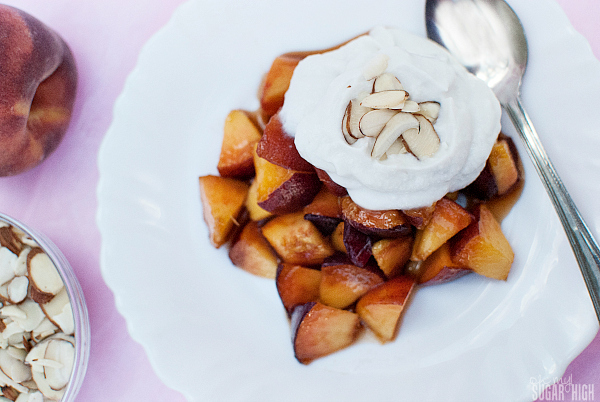 The coconut whipped cream is the perfect thing to complement these peaches! If I don’t have coconut milk on hand, I usually just use whipping cream. Nectarines can easily be substituted for peaches since they actually grow on the same tree.